This incredible tool can't be beat! It's the "biggest bang for your buck" in the hand pick/patiche world. Field tested in the summer of 2011 by Historic Archaeologists, it moved 60 pound foundation stones from an excavation unit (70cmbd) without a problem! 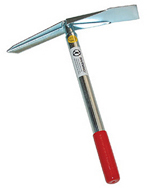 The 12.5" head is a mini mattock on one side and a pick on the other - solidly welded to the tube steel handle. Includes a sturdy plastic grip for easy handling. Will not bend, break or rust! Overall weight is 2lbs. 7 oz.